Any gardener knows that cultivating a garden is a process, and as the years go by, the garden comes slowly and mysteriously into its own. Seeding Your Soul is a distinctive short guide to nurturing spirituality that uses well-known Gospel passages. 6 Considerations: "Planting Trust," "Planting Generosity," "Planting Love," "Planting Transformation," "Planting Forgiveness," "Planting Healing"
Seeding Your Soul Dianne R. Costanzo Bolchazy-Carducci Publishers 1000 Brown Street, Unit 101 Wauconda, IL 60084 0865165920 $14.95 bolchazy.com Seeding Your Soul: Six Considerations For Spiritual Growth is a self-help guide to visualizing one's spiritual landscape, and promoting inner growth through the positive qualities of Trust, Generosity, Love, Transformation, Forgiveness and Healing. Beautiful full-color photographs of flowers complement words of wisdom for cultivating healing virtues, written by teacher, poet, and spiritual director Dianne R. Costanzo. Simple insights and the alle-gory of one's mind and soul draw upon Biblical passages and noble ideals to create a transformational, uplifting experience. 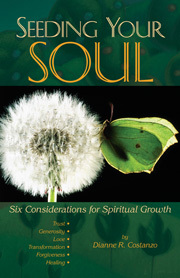 Seeding Your Soul: Six Consideraions For Spiritual Growth is very highly recommended reading.